Before we get into the food, a heads up that I just added two new movies to my favorites list: Inception and Easy A. Both movies made the solid “like” list. Inception was so close to making my “love” list, as it really is an incredible movie, but Leonardo Di Caprio was just not believable for us in the lead role. He seemed forced and I just never quite bought into his character. The supporting cast was great – I think using a no-name in the leading role may have been a better way to go. I debated adding Easy A to the list at all. It is totally mindless, and goofy, but really, sometimes we need that right? Both Tony and I giggled our way through and felt relaxed after watching it, so I have to recommend. Trust me, I’m not recommending every movie I see either! We watch two to three movies a week since we don’t have TV, and boy have we seen some dogs lately (I even walked out on one!). But no need to dwell on the bad ones when there is a whole list of favorites to enjoy! Have you seen any good movies lately? Back to the food … I was inspired by Asian Fusion yesterday, a vegan cookbook that came across my desk a few weeks ago. I had a craving for tofu (yes, I’m weird that way), so I picked up the book and low and behold, it fell right open to the recipes for Spicy Tofu and Sushi Rice. Hmmm, spicy tofu hand rolls anyone? To note, Asian Fusion looks like a great cookbook if you are looking for vegetarian/vegan options that are close to authentic. The chapters include Thailand, Burma, Vietnam, India, Sri Lanka, and beyond. I haven’t gotten too far into the book yet as I need to acquire some ingredients to make the recipes that intrigue me. 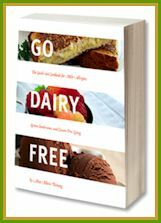 But if you are ready for some adventure and vegan recipes, this could be a great fit. This recipe is Vegan, Dairy-Free, Egg-Free, Gluten-Free, and Nut-Free (but check the ingredients of the sauces!). Combine the tofu with the soy sauce or tamari and mirin. Let it rest while you heat the chili oil in a skillet over medium heat. Once heated, add the tofu, and cook, stirring for a few minutes, or until it is nice and heated through to help combine the flavors. Technically, you can skip the cooking part, but I prefer tofu after it has been cooked. Place the tofu in a bowl, let it cool for ten minutes or so, and then stir in the sesame oil, mayo, sriracha, and green onions. Layout the ten nori sheet halves, and with damp hands (I keep a bowl of water next to my workspace), press some of the sushi rice onto one side of each sheet. Add a slice of avocado onto each portion of rice at an angle, and top with a couple generous tablespoons of the tofu filling. See this post for a little visual on how it will look at this point, with tofu though instead of shrimp. Starting at the bottom corner on the rice side, roll them up to make cones. This takes practice, but you will get the hang of it quickly. Serve with soy sauce/tamari, and even wasabi if desired. What are your favorite sushi hand roll fillings? This looks amazing. I must try this combination of flavors soon. 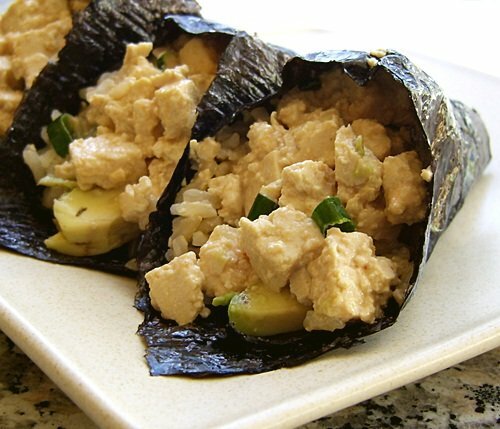 I love spicy tempeh for hand rolls, so I am sure I woudl love spicy tofu handrolls. Why does everything delicious and creamy looking have to have mayo? I wonder if I could make that without it, and just use extra avocado? Or cashew cheeze maybe? You know what’s crazy…I am posting about sushi in the morning. It was going to go out tonite but I decided to post about the neighborhood walk skylar and i took. Katie (above me!) says she makes sushi without a mat all the time. Katie – sorry, I do like vegan mayo (not the regular stuff … go figure). Averie – I like the hand rolls for simplicity and ease (very fast! ), but you can easily make nori rolls without a mat. It is just about firmly rolling so that the fillings don’t fall out when you slice the roll. The mat just helps with pressing and shaping, but my husband often uses plastic wrap for this, and I’ve had some success free-form. Perfect lunch I would say. Oh yum yum yum, I am licking my lips. This looks fabulous! Can’t wait to try it – it’s in the queue! Damn, I just used my tofu that had been in the fridge, last night. Oh well, time to buy more. This looks great and easy (A?) hehe. 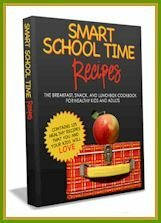 I really like this recipe though! YUM. I’ve never made sushi handrolls myself, but when I buy them my favourites are definitely the seaweed hand roll, and the marinated mushroom handroll 🙂 I don’t think I’ve ever really had the mayo ones (more of an American thing, I think), but this recipe of yours does look scrumdiddlyumptious! Okay, my favorite filling is spicy Tuna (not tofu, sorry)! 😉 But this recipe totally works for the tuna! YUM! And side note, I agree with you about Leo as the lead role in Inception. I think someone else would have done a better job! But the movie was still totally AWESOME! Thanks for the recommendation Lori! Hannah, I love mushroom rolls too! will have to do that next. Kim, I love the spicy tuna too, but have a shrimp version on the blog. What a unique sushi roll! My favorites are the ones come from Miya Sushi in New Haven, CT… They do such creative, unusual combinations, and lots of vegan options. The “wandering poet roll” and roasted garlic, black bean, asparagus rolls are not to be missed! Haha, we watched both of those recently and felt the same about both of them. Have you seen “House Bunny”? Totally mindless, but so good! We joke about how much we like that one since there is really no substance. The rolls look delicious! I love veggies (except avocado) and I loved tofu in them…but sadly no more. Oh how I miss tofu! That close-up shot is killing me! These sushi look absolutely delicious with the brown rice and I love the spice with the Sriracha! Inception lovers unite! Such a great movie. Oh and sushi. One of the loves of my life. This filling sounds fantastic!